Victor Harper Couture is now on Facebook! 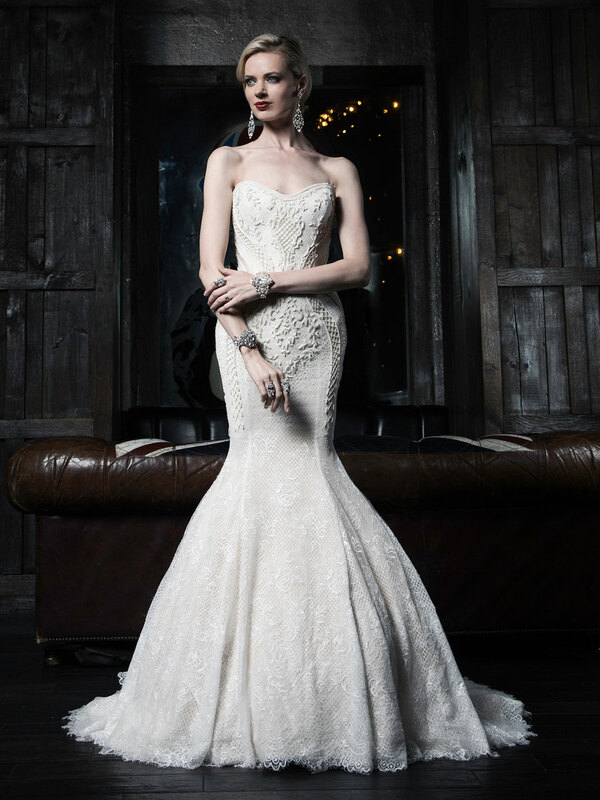 Get the latest news, events or the newest gowns by Victor Harper. Keep updated on the latest trends and styles. Follow us on Facebook© today! Keep informed on our latest news and events! Inspired by the musings of feminine sophistication, elegance and sensuality, the Victor Harper Collection weaves together glamour, refinement and drama in perfect silhouettes to mold and flatter the body. 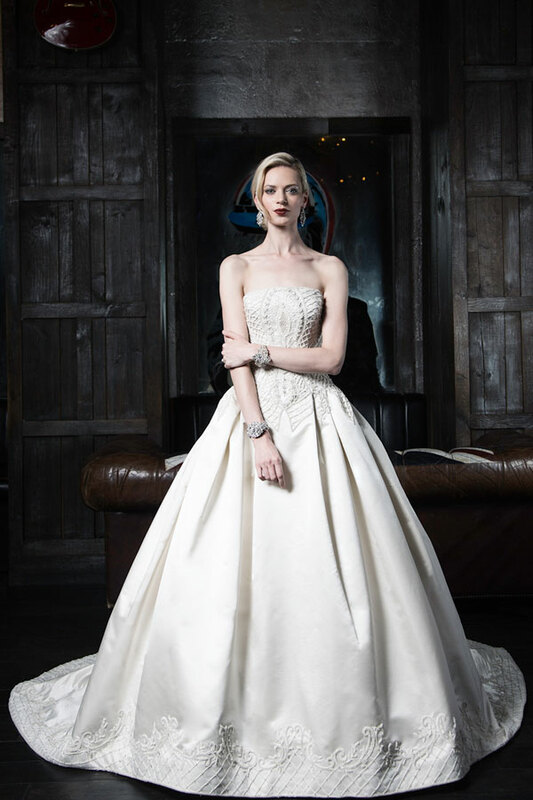 Plunging embellished neckline with crystal straps and a full tulle ball gown skirt. Embellished bodice with mikado, fit and flare skirt and embellished hem. 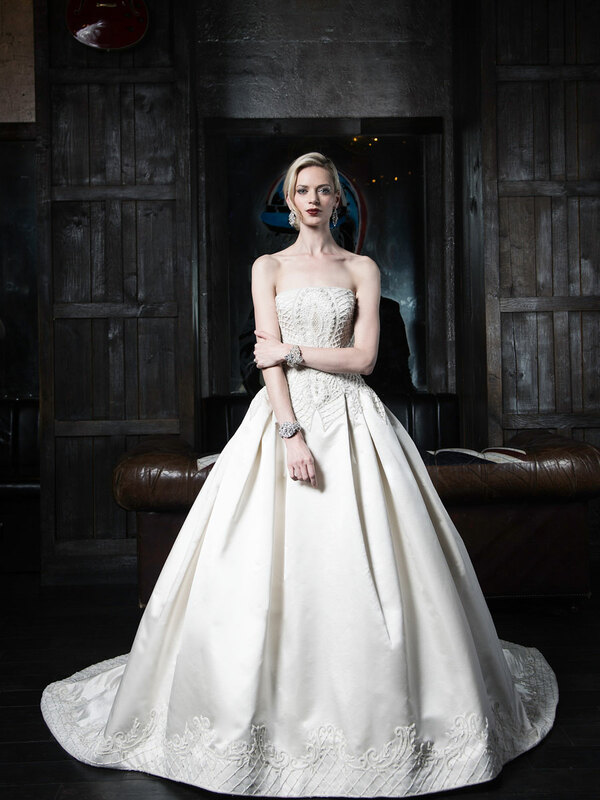 Strapless satin ball gown with dropped waist peplum skirt and detachable embroidered belt. Embellished bodice tops a fit and flare skirt with top stick style lines. Custom embroidered lace gown with cap sleeve and fit and flare chiffon skirt. Chantilly lace fit and flare gown with fully embellished bodice. Embellished bodice with square neckline and straps. Full ballgown skirt with embellished hemline. Fully embellished gown with cap sleeve and chiffon fit and flare skirt. Custom embroidered lace bodice with full length sleeve and tulle ball gown skirt. Sweetheart strapless neckline sheath skirt with front open slit embellished with Macrame lace. Illusion long sleeves with cutaway neckline, bodice embellished with beaded lace Ballerina ball gown. Beaded embroidered strapless sweetheart gown with soft draped sheath skirt. 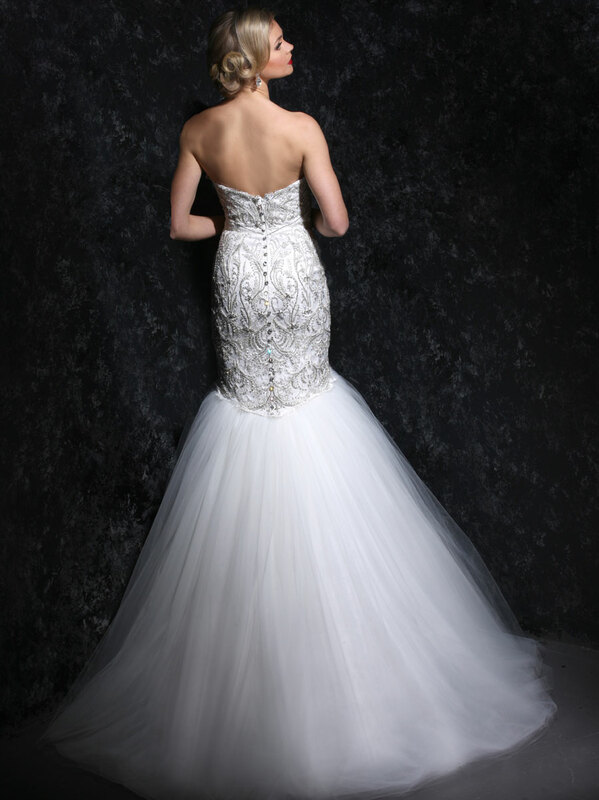 Strapless fit and flare gown with 3 dimensional texture beading throughout bodice. 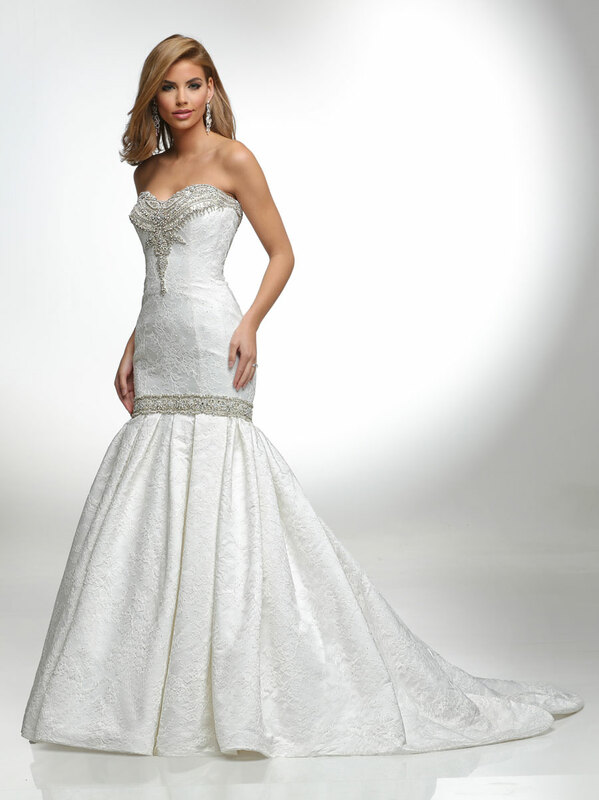 Strapless gown with dramatic contoured seaming accented with micro piping and waist beaded belt. Stapless A line gown with with stitch piping detail, and jewel empire bodice. beaded Chapel train. Strapless French lace fit and flare gown. 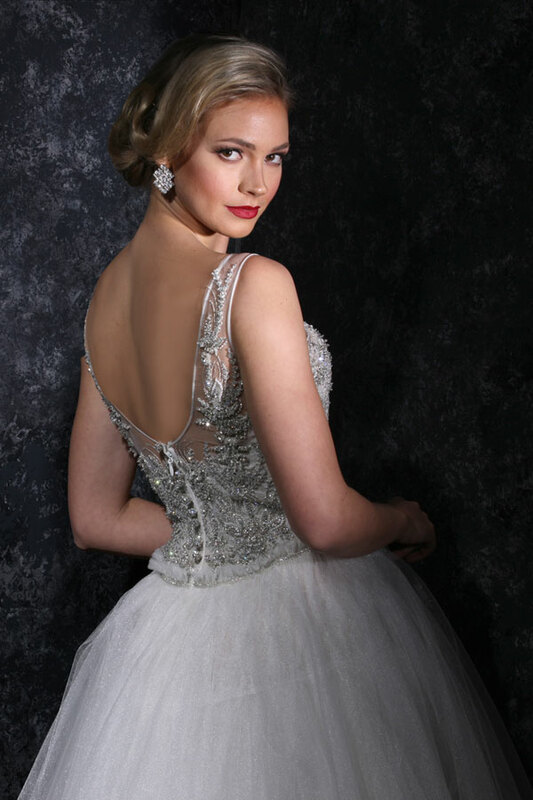 Sweetheart neckline and hip line embellished with intricate beading. Strapless ball gown with fully beaded dropped waist bodice. Sweetheart strapless gown, A line skirt embellished with hand craft floral design natrual accented with belt. Slim A line gown with draped bodice, illusion cap sleeves and back accented with cluster pearls embellishment. Soft draped A line gown with halter neckline accented with intricate beading, back detail embellishment. Textured sequin and lace fit and flare gown with layered tulle skirt and lace slip petticoat. Textured sequin and lace strapless tulle ball gown. Silk zebeline fit and flare with beaded fringe cowl back and beaded fringe train. Beaded Embroidered Lace Strapless fit and flare gown. Silk satin fringe blouson strapless corseted fit and flare gown. 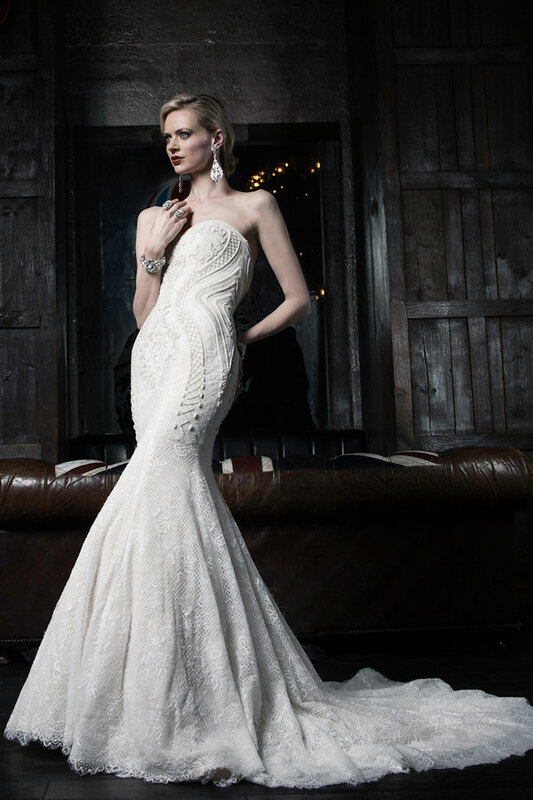 Fully Corseted Sculpted cutaway mermaid crepe gown. Corseted lace ballerina ball gown with imported Italian glimmer tulle. Sculpted cutaway lace fit and flare gown with lace petticoat slip. Fully corseted one shouldered goddess gown with lace bodice under hand ruched chiffon with lace under slip and chiffon overskirt. Fully Corseted bodice with dramatic cutaway neckline and fully beaded illusion with long sleeves and full sweep chiffon skirt. Exaggerated trumpet skirt strapless gown with dramatic contoured seaming accented with micro piping in a Mikado. Silk jacquard organza strapless ball gown with full corseted bodice under hand draped organza. Beaded fringe blouson three-quarter sleeved, full leg jumpsuit with off the shoulder illusion neckline. Strapless A line gown in embroidered lace. Beading at neckline and hipline. Silk satin gown, fit & flare cap sleeve stretch illusion yoke and back with jewel embroidery. Strapless fit & flare gown in lace, bodice with embroidered banding. Strapless fit & flare silk gown. Corset bodice in lace over clear sequins with piping. Strapless mermaid gown in satin, jeweled draped fringe torso, and layered tulle skirt. Strapless column gown with deep V neckline. All over embroidery on tulle. Long sleeve fit & flare gown in silk. 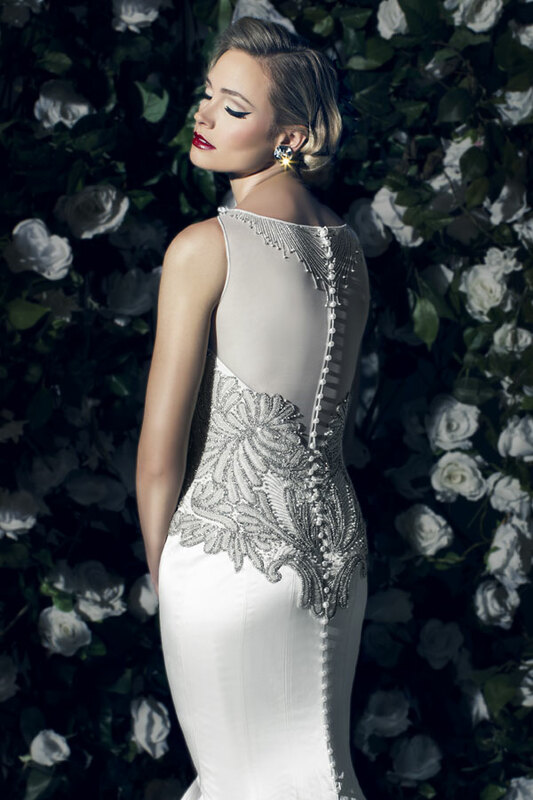 Bodice is stretch illusion with embroidered lace and appliques. Strapless mermaid gown in satin rayon draped fringe torso. Embroidered neckline and train, satin skirt. 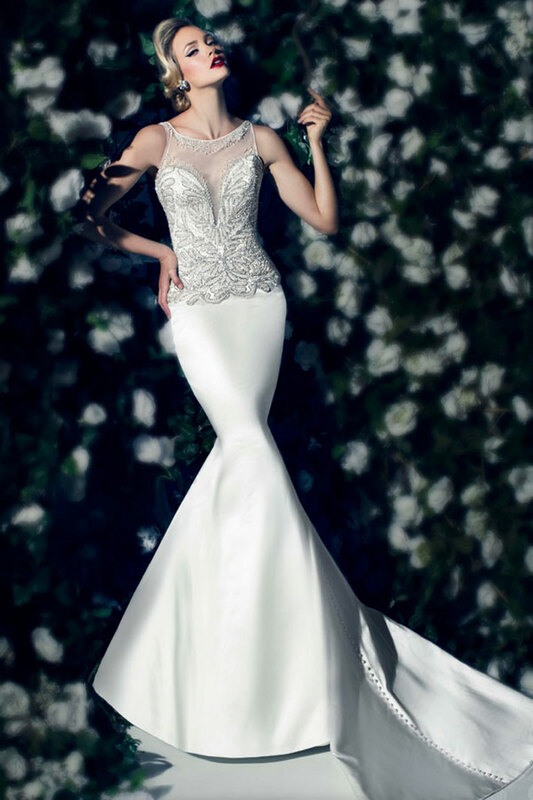 Lace strapless mermaid gown with corseted bodice and embroidery and jewels at neckline and hipline. Strapless tulle column gown with beaded bodice and skirt design. Strapless ball gown in Satin. Embroidered beaded bodice & hip line. Tier panel, back train. Column gown with stretch illusion beaded bodice & yoke. Deep V neckline, narrow fishtail skirt. Strapless Mikado silk, fit & flare gown. Bodice is micro bugle bead bands over Chantilly lace. Strapless silk taffeta draped gown with assymmetrical tiered tulle skirt. Embroidered neckline and hipline. Tank style fit and flare satin gown. Paneled skirt, embroidered bodice, and sheet illusion back with embroidery. Strapless"A" line satin ballgown. Embroidered beaded bodice. Assymmetric hip line with side draped skirt. Strapless silk faille fit and flare gown. Embroidered neckline and hip line with draped back skirt and train. Strapless column gown. All-over beaded embroidered on tulle. Strapless ballgown with embroidered natural waist bodice. Silk Taffeta skirt with embroidered train. 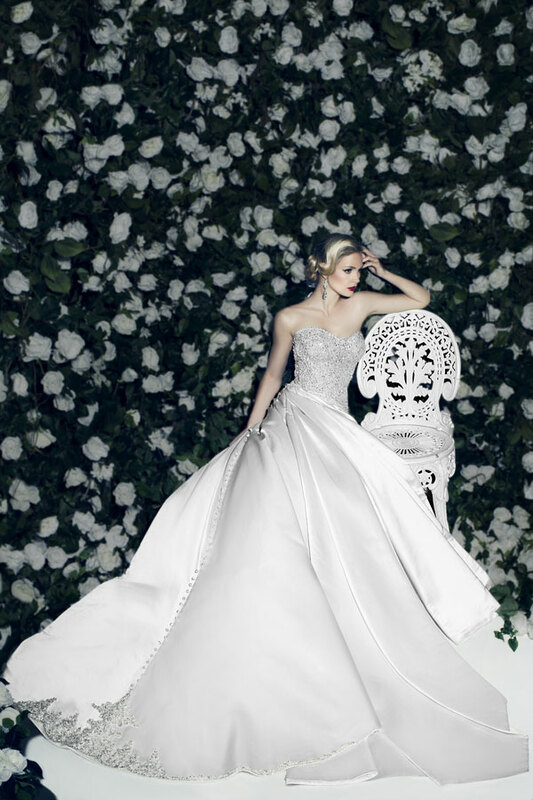 Strapless ball gown with black, silver, smoke beading embroidered on bodice and large train. Strapless fit and flare gown with black, silver, & smoke embroidered tuxedo beading belted waist. 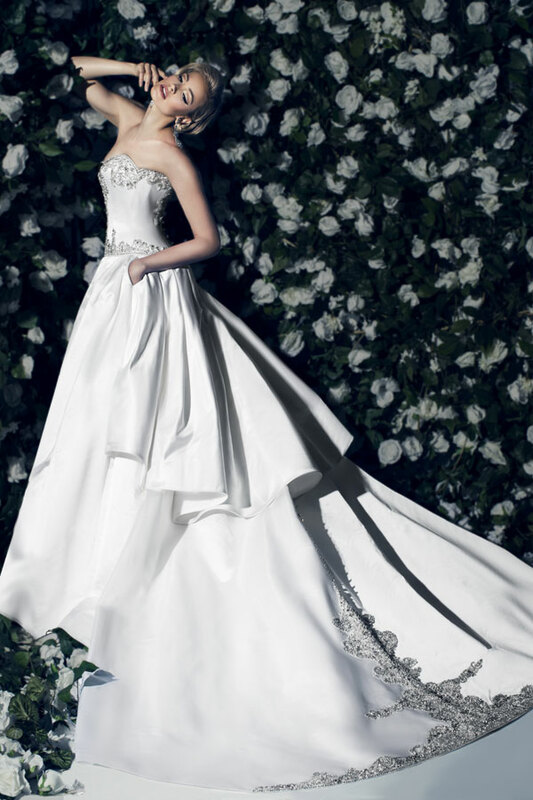 Strapless silk tulle gown, embroidered bodice, full back sweeping skirt with large embroidered train. Strapless bugle bead embroidered tulle gown, draped bodice, silk charmeuse lined. Strapless fit to flare ribbon French lace gown with embroidered bodice and belted waistline. Strapless ombre satin ball gown with ribbon lace & beaded bodice. Strapless bias seamed fit to flare gown in silk & cotton, with top stitch detail, embroidered bodice and train. Stapless satin fit and flare gown with top stitch detail, and jewel empire bodice. Strapless ombre satin ball gown, draped bodice with embroidered hipline & neckline, long emobroidered train on full skirt. Strapless silk taffeta draped "mummy" fit to flare gown, beaded & embroidered neckline. Strapless embroidered and beaded tulle gown with lace hem, tiny bows on bodice. Illusion jewled & embroidered bodice ballgown, 3/4 length sleeve, silk taffeta skirt, embroidered train. Strapless satin mermaid gown with pearl & jeweled bodice. Strapless multi-layered tulle ball gown with large bodice embroidered neckline & lace hem. Satin Strapless fit and flare gown with stitched panel bodice with embroidered neckline, hip and train. Silk Mikado fit and flare gown with stitched panel detailing on torso and embroidered neckline and train. Satin strapless natural waist ball gown with embroidery at neck and waist line and embroidered streamers. Satin strapless A-line natural waist skirt gown with side pleat skirt and embroidery on bodice, waist and train. Satin strapless fit and flare gown with back pleated train, embroidered bodice, sheer illusion back and train applique. Strapless tulle ballerina ball gown with silk stitched satin bodice and embroidered hip line. Strapless ball gown with lace and boned bodice with embroidery at neck and hip line with sheer back and satin skirt. 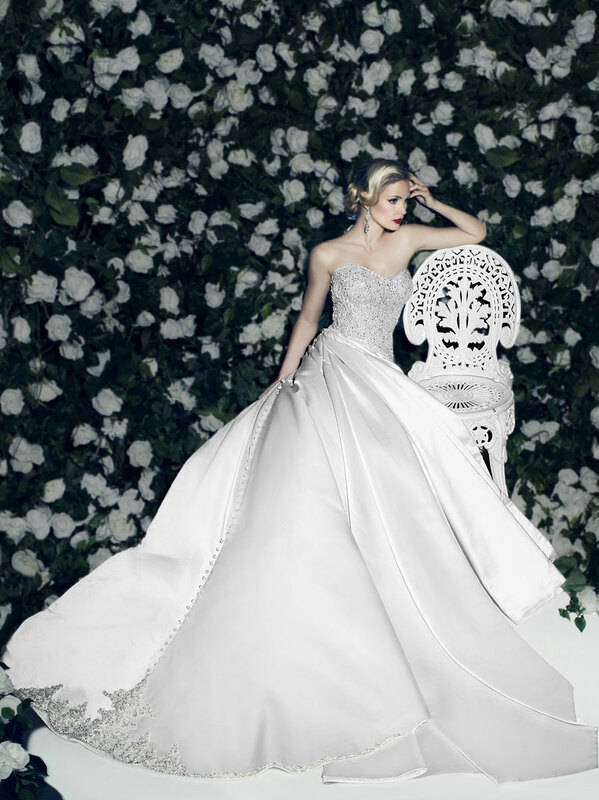 Satin strapless ball gown with embroidered bodice, side panels on skirt and train applique. Strapless tulle ballerina drop waist ball gown with stitched satin bodice and embroidery at neck line and skirt train. Silk cotton jacquard strapless fit and flare gown with wide jeweled band at join line, elaborated jeweled train and delicate beads at neckline. *Also available in Satin. Alencon lace strapless fit and flare gown with draped tulle overlay, jewel trim on torso and draped pick-up skirt with tulle overlay. Silk taffeta strapless ballgown with draped bodice, wide jeweled cumberbund and full side draped ball skirt. Satin A-line gown with jeweled illusion yoke and back, side pleated skirt with edge stitching. 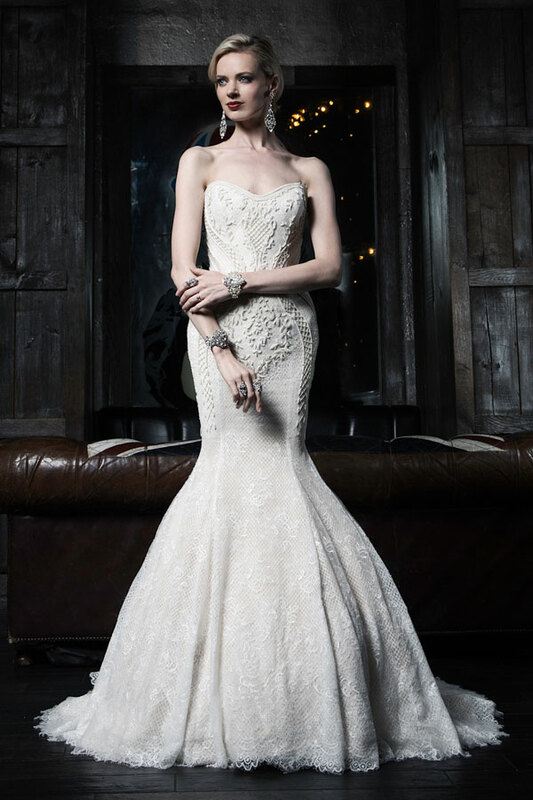 Silk Mikado strapless mermaid gown with jewel beaded deep V-neck line, jeweled train and stitch panel skirt. Silk Gros ball gown with jeweled bodice and front and back skirt applique.